While doing disassembly, I found that the inertia switch jump looked melted. That may have been why my engine wasn't running. Starting to make progress on dissassembly. I had to leave cause the disconnected gas lines gave off a lot of fumes. Anyone know how to take the air intake out of the pontoon? I got rid of the last containers of gas today. Absolute nightmare to dispose of legally. I got the fuel tank out. Found it easier to use my jack lever as a pry bar from the top. A partial battery pack will eventually occupy this space. Got back into the VOD today and it looks like I didn't reinstall something properly. Seeing how there's more coolant near the front of the car, I'm assuming maybe the Y pipe. Aside from that, I got a ton of wiring disconnected. I had a vacuum tube from the interior pulled out, but thatll be going back in. The block has been drained of coolant for the final time. I just got these rubber pads in today. Bought the last pair for the stands. The one for the lift is definitely looks too thick for when the car is on the ground though. Also visible is the cleaning i started on the frame where the fuel tank was. Wiring harness is out. I'm just about ready to pull the engine. Fascinating project, thank you for posting. 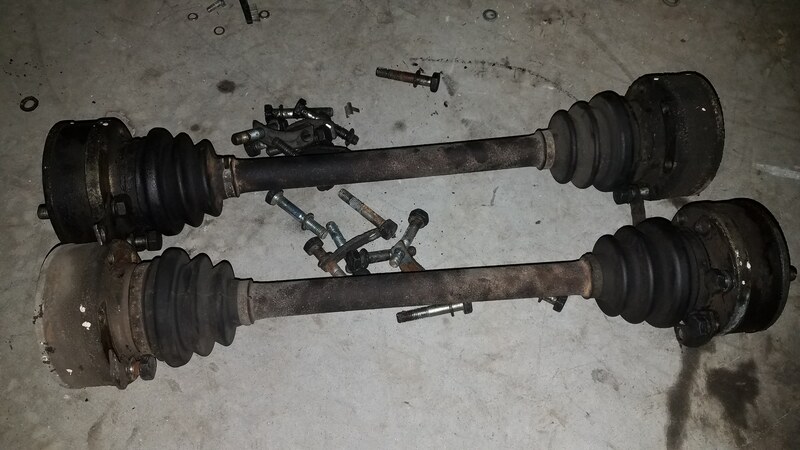 Cleaned the garage a little and took the axles off today. Not hard at all. They broke loose easy and it was pretty much just time consuming. Progess looks meh up top. I got the clutch lines removed. Clutch slave, starter and exhaust are now all off. I also picked up a transmission jack and engine hoist from harbor freight. I got PB blaster all over the car. Catalytic converter was also a pain to remove. Hopefully I got enough PB on the fuel filter to break that loose. Got the transmission "out". Didn't realize it acted as a counterbalance to the engine. I put some jack stands under it for tonight and hopefully taking it out tomorrow. I did it this way because i dont have enough clearance to pull the transmission out with the engine. I didnt get a picture but one of the transmission mounts broke. Looks like there was an existing crack and the transmission jack or breaker bar was enough to break it off. Theres a good chance I'll need to take off the bellhousing so that the transmission can clear the frame.